Middle East Perspectives by Rick Francona: Can you spell W-A-G-T-H-E-D-O-G? Now that the United Nations has passed a watered-down fourth sanctions protocol against the Iranians, and governments in Europe and the United States are working on unilateral sanctions that allegedly go further to punish the regime in Tehran, Iran should be soon announcing its compliance with demands of the rest of the world, right? Hardly. The Iranians remain defiant, even to the point of announcing the construction of more nuclear facilities and the intention to inspect foreign ships in the Persian Gulf if merchant ships bound for or departing Iran are stopped and searched by powers enforcing the UN sacntions. I doubt anyone is surprised by this reaction from Tehran. There have been other, more subtle things happening that bear watching. One is a statement by U.S. Secretary of Defense Bob Gates that American efforts are still aimed at preventing Iran from acquiring nuclear weapons rather than containing a nuclear-armed Iran. Gates, as Secretary of Defense, has a vested interest in not having to develop measures to contain a nuclear-armed state run by a repressive government dominated by Islamic fanatics hell-bent on destroying a U.S. ally. Now that Gates has defined America's policy towards Iran, just how does the Obama Administration plan to accomplish that task? Thus far, every effort that the Administration has tried has abjectly failed. The policy of engagement and sanctions has failed to yield any results other than increased Iranian production of enriched uranium and increased defiance of the rest of the world. Even normally stalwart American allies in the region, most notably the Kingdom of Saudi Arabia, have determined that the Obama Administration does not have a viable plan to prevent Iran from acquiring a nuclear weapon, let alone containing the country once it gains the capability. (See Saudi frustrations with Obama's foreign policy failures.) Many fear that American weakness and failure to lead on this issue actually creates instability in the region and may in fact trigger a nuclear arms race - Saudi Arabia and Egypt might be concerned enough about a nuclear Iran to develop their own capabilities. Time for a negotiated diplomatic solution to this problem is fast running out. I think by now even those in the U.S. intelligence community responsible for the ludicrous conclusion in the 2007 National Intelligence Assessment that Iran had stopped its efforts to acquire a nuclear weapon are convinced that Tehran means to do just that. Candidates Obama and Hillary Clinton said as much during the presidential campaign in 2008. If those analysts still cling to that assessment, they are pretty much alone. 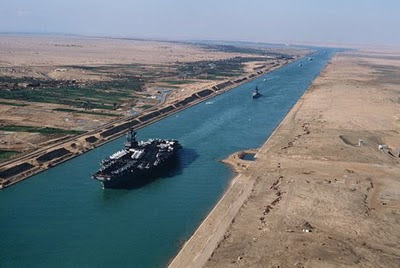 Perhaps there is some credibility to media reports that 12 U.S. Navy warships (most likely a carrier strike group), with at least one Israeli naval vessel, transited the Suez Canal last week from the Mediterranean Sea to the Red Sea presumably en route the Persian Gulf. If so, that would add to the already fairly robust U.S. military presence in the region - the movement of an Israeli warship is also of note. I received an email from a former colleague with many years of experience in intelligence and policy matters. He asked if perhaps President Obama "wants to distract us from his astute handling of the oil spill fiasco by starting WWIII?" I said that would be reminiscent of the movie "Wag the Dog" that parodied President Bill Clinton's motivations for not aggressively hunting down Usamah bin Ladin. I sincerely hope we are wrong. If the President is moving American military forces into the region to further pressure the Iranians into compliance with international demands, I support and applaud that action. I also hope he is prepared to use that force if necessary to prevent Iran from acquiring a nuclear weapons capability and triggering an arms race in the region. If he is using the Iranian nuclear issue to divert attention from the Gulf oil crisis, he will have failed to solve either issue.